With the cold winter weather in full swing here in Perth, lots of people around me are coming down with sniffles and sore throats. This tea is very soothing and warming, and I like to think that drinking it every few days has helped me stay free of colds. 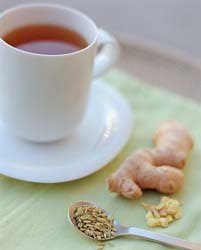 Place a teaspoon each of chopped fresh thyme, sage and ginger root in a 500ml (2 cup) teapot and top with boiling water. Allow to steep for 10 minutes, then strain into two cups. Add some lemon juice to one cup, sweeten to taste with honey, and sip. Set the other cup aside to cool and use as a gargle several times a day.